Weâ€™re coming to Orlando for a Star Wars Celebration panel on April 14th, and I cannot wait. See you there! It seems that on April 14th Johnson will be headed to Orlando for a Star Wars Celebration Panel. Hrmmm, I am in Georgia… maybe.. just maybe… It is not that far after all. 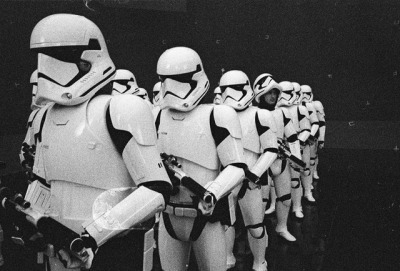 One thing that I do hope for these poor Storm Troopers is that Captain Phasma will not be around, because I do notice one soldier that would be demanded to report for reconditioning. Star Wars: The Last Jedi drops on Dec 15th of this year, and will star John Boyega as Finn, Daisy Ridley as Rey (Skywalker???? ), Adam Driver as Kylo Ren, Oscar Isaac as Poe Dameron, Carrie Fisher as Leia, and Mark Hamill as Luke Skywalker.